Geodes are a type of natural rock formation that contains a cavity lined with crystals or another type of mineral matter. They are formed as a hollow bubble inside of a layer of rock which was created by volcanic forces or chemical precipitation. The word Geode comes from the Greek term, Geoides, which means Earth-like. In the healing world, geodes are strange phenomena to many and hold a meaning that assists with harmony and creativity from a metaphysical perspective. Bigger geodes can help create a chi flow in areas of your home. 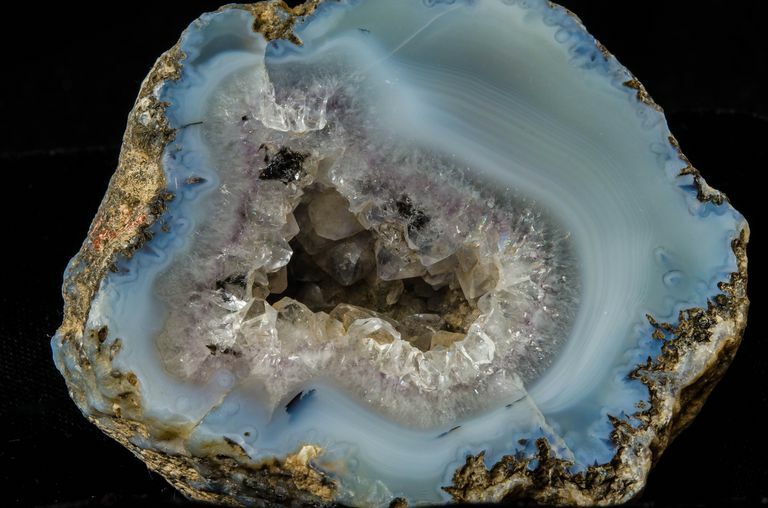 Many see geodes as a feminine property due to the cavity which could represent the womb. Geodes can help communicate with divine beings and assist in creating better moods, balances, and energies that can help with meditation, stress, and decision-making. Their multiple uses come from the fact that crystal formations vary and each crystal varies in minerals held. Across the board, they have many health benefits and promote well-being. The geode comes with many different mineral crystals, such as quartz, amethyst, and citrine. They can help you to see the whole picture and helps with coming to a decision before things get out of hand. It helps one have the ability to shape one's own future and bridges communications with the Higher Deity. Geodes also help with communications between people who are in the same healing fields. They can assist one in astral travels and are good tools for meditations, especially the amethyst geodes. These stones can be good for soothing and de-stressing and aid in spirituality and psychism. The Rock Garden of Peace sacred place is a Catholic refuge. One doesn't have to be of the Catholic faith to soak in the good vibes from this blissful garden.